DHA omega 3 is one of the most complex and beneficial of the omega three fatty acids. It has an important role to play in the development of the brain and the nervous system. It is especially important in the case of pregnant women. In the adults, it is important for the normal functioning of the adult brain and the nervous system. EPA is also a very important fatty acid. Though it also has an important role to play so far as the human brain is concerned, its role is more important in the case of the hormone and immune system. The role of DHA can be thought of as more related to the structure and functioning of the body. It is a very important part of the cellular membranes and is highly concentrated in nerve tissues-including the eyes and the brain.EPA has a more regulatory role to play. They are the precursors to an important hormone like chemical that is produced in the body called the eicosanoids. An important difference between the two is that DHA is more readily absorbed in the human body compared to EPA. It is more easily available from the foodstuff you take in. 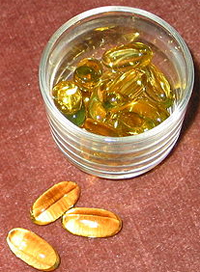 The most important source of DHA and EPA are fish oils. DHA is also found in large amounts in walnuts, leafy vegetables and some micro algae. They are also used to treat conditions like high blood pressure and diabetes. DHA also differs from EPA in its basic characteristics. DHA is composed of a 22 carbon chain that has 6 double bonds. On the other hand, EPA has five double bonds. This is what makes it less available for absorption by the human body. Deficiency of EPA may lead to a number of conditions like dryness of skin or depression. The deficiency in DHA is expressed in the form of lack of fluidity in the cell membranes, ADHD or lack of mental development in premature kids. Both EPA and DHA are a very important part of the nutrition in a human body. A deficiency in any of these fatty acids can cause severe conditions like heart disease or nervous disorders. 2. DHA influences the functioning or structure of the human body, while EPA has more to do with the regulation of the circulation system. 3. The basic structure of DHA ids different from EPA. Purpa Mukherjee. "Difference Between DHA and EPA." DifferenceBetween.net. September 30, 2009 < http://www.differencebetween.net/science/health/difference-between-dha-and-epa/ >.